The Grande Store Storage Unit from Keter is a large storage unit with a modern exterior design and practical features. 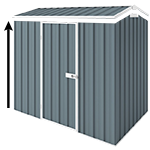 The unit can hold anything between 2 360L/96 bins PLUS your gardening tools. Or it can be used as a Bike shed to hold 2 adult and 2 children bikes. Colour: Wood like texture & Grey/Anthracite colours. BONUS: You can paint the walls to suit your taste! Why buy a Grande Store Resin unit? The walls are made of reinforced DUOTECH™ which is best construction material for outdoor products.